Newsflash! : The California State Assembly’s Appropriations Committee on Wednesday approved SB 767, which would allow Metro to place a sales tax measure on a future ballot. The bill next goes to the full Assembly. It has already been approved by the Assembly’s Transportation Committee and the state Senate. @railLAorg @metrolosangeles @FYFFEST when there's a major event going on at Exposition Park, the Expo Line is smartest, sanest way to go. The Dustbowl Revival just played Union Station last Friday as part of the Metro Arts Presents series. Check out the pics here. Great show, great band. Peter Castillo: More rail options to and from the Valley considering how packed the Orange and Red Lines are. Armando Aparicio: It would be great to have a subway from the valley to the West Side. That 405 is a nightmare. Hector Maceas: Turn off those dumb Lexus lanes known as FastTrack lanes. That’s how. Gregory Gilmer: Work on making your buses more reliable. It is unacceptable that late or missing bus operators are allowed. I’m a transit proponent. But if buses aren’t reliable I will not take them for work, only for leisure. Nina Kin: kind of a chicken or the egg problem… how can the buses be on time if they get stuck in traffic? how do you reduce car traffic and convince people to take the bus if you can’t rely on the bus times? I hope eventually we’ll reach a point where they’re frequent enough we won’t need to know the schedules, but we need more ridership for that to be economically feasible. Nevram Norman: Move beyond talking about change and actually change. Pass a ‘Complete Streets’ policy that is actually useful. Invest real money into biking infrastructure, especially to/from rail stations throughout the region. The Sepulveda Pass Transit Corridor project is scheduled to receive about $1 billion in Measure R funds. The project would not be complete until the late 2030s under the current long-range plan timeline. Very early studies have looked at the project possibly being an underground rail line or perhaps bus rapid transit using the freeway. For something like a rail tunnel, the project would need considerably more money. The Gold Line Foothill Extension is scheduled to open next year with stations in Arcadia, Monrovia, Duarte, Irwindale and two in Azusa — one downtown, one adjacent to Rosedale and Citrus College and Azusa Pacific University. A separate project — the Eastside Gold Line Transit Corridor Phase 2 — is looking at two possible rail alternatives: extending the Gold Line to South El Monte or Whittier. More studies are being done. The project isn’t scheduled to be complete until the mid-2030s under Metro’s current long-range plan. Metro is also in the midst of potentially updating its long-range plan along with a potential ballot measure in 2016 to raise funds for projects. It remains to be seen if the ballot measure would raise money to accelerate projects. Droughts have happened regularly in California over the centuries — and you can blame a stubborn ridge of high pressure for the current one. But new research finds that warmer than usual soil temperatures courtesy of higher temperatures — courtesy of global warming — have exacerbated the drought. Don’t care for climate change? Want to do something? Try walking, biking or taking transit instead of driving alone all the time! Generally speaking, transit moves people more efficiently than driving alone in traffic. A lot of studies and stats have suggested that overall people are driving less, at least in some places. But it doesn’t appear that the people who do drive are driving any safer. From January to June, nearly 19,000 people died in traffic crashes across the U.S., and more than 2.2 million were seriously injured[ii], putting the country on pace for its deadliest driving year since 2007. Costs are also up. The six-month estimated bill for traffic deaths, injuries and property damage is $152 billion – 24 percent higher than 2014. The NSC blames, in part, lower gas prices and higher employment across the U.S. — i.e. people are driving more. Also blamed, not surprisingly: distracted driving. Sigh. 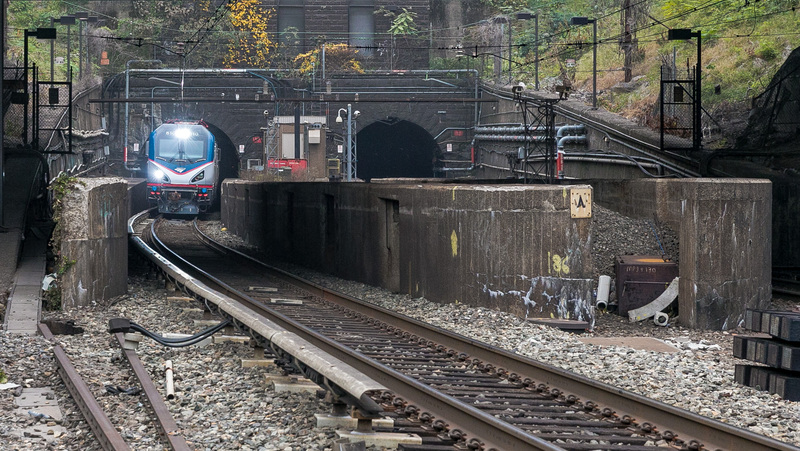 By most accounts, a new train tunnel under the Hudson River is desperately needed to help some 750,000 daily passengers travel between Manhattan and New Jersey. The cost of a new tunnel: about $20 billion, which also includes a new Penn Station on the NYC side and a new bridge on the Jersey side. How to pay for it? Jersey Gov. Chris Christie cancelled a tunnel project a few years ago, citing the cost. He says he’s open to restarting talks and other pols — i.e. New York Gov. Andrew Cuomo — have said a huge federal grant would be a good place to start. Nothing against federal grants: Metro is using coupling some with Measure R funds to build the Regional Connector and Purple Line Extension. We ❤️ federal grants! Key word there: grant. As in something that doesn’t need to be paid back. The significance is that the feds usually don’t dole out that kind of money for a single project, although this is a key rail link. My question: if the feds pay for most of the project, how will that impact federal funding needed to help build transit projects in other parts of the country, by which I mean Los Angeles County. The Compton Courthouse. Photo by Jessica, via Flickr creative commons. These are merely brief glimpses of the truth: The real Compton does not fit the ghetto cliché—and would surprise rap fans the world over if they were to visit. Yes, Compton is poor and has serious educational challenges (fewer than 60 percent of adults 25 and older are high school graduates). But it’s really a working-class suburb, defined by its single-family homes and neighborhoods like Richland Farms, with lots big enough for elaborate gardens. 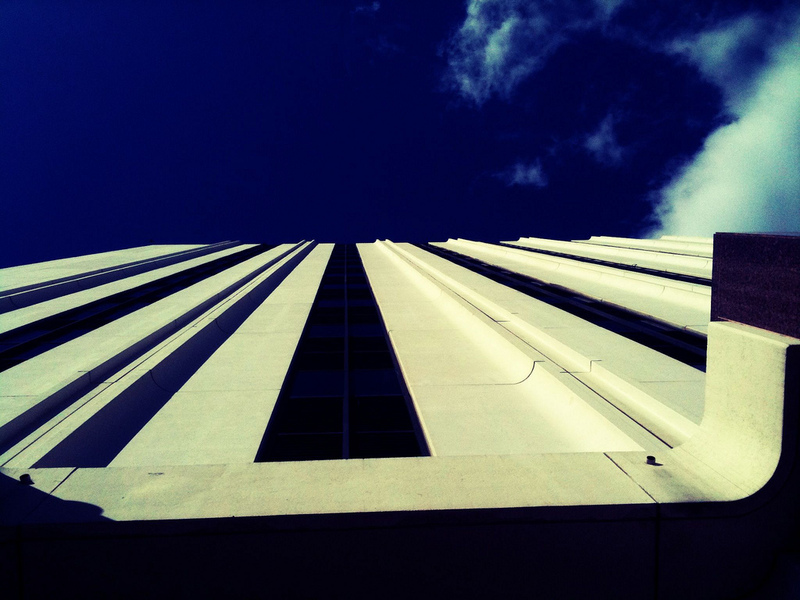 Only 19 percent of its housing is multi-unit, compared to 31 percent across California. And Compton’s south side, along the 91 Freeway, is a thriving industrial and business district that includes the corporate offices of leading grocer Ralphs. Compton is easily reached on the Metro Blue Line, btw. It’s about a 28-minute ride from 7th/Metro Center in DTLA and a 22-minute from DTLB. If you ever are assigned jury duty there, be warned: sloooooowest courthouse elevators in the world if nothing has changed in the past few years. The old frequent bus map in Houston is on the left. The new map is on the right. Not the first time we’ve mentioned this, but the post is a good look at Houston’s revamped bus network that aims to concentrate more frequent buses on key routes along with trimming some routes that are duplicative or less used. The idea is to make buses more useful to those who already ride and more appealing to those who don’t by reducing the time you wait for a bus — and the time it takes the bus to get from Point A to Point B.
I’m hesitant to call this a trend at transit agencies, although Houston is certainly not the only one to try this. Metro is also working on its own frequent bus network although nothing is ready yet to go before the board. A synopsis was posted online earlier this summer and this is something I’ll be writing more about soon. Things to look at while sitting/standing/stuck on transit: Check out Ashly Stohl’s “Charth Vader” photo gallery. Entertained you will be. Ashly is an Angeleno, btw. Things to look at while sitting/standing/stuck on transit 2: another entertaining photo gallery, this one at the New Yorker website and titled “The weirder side of convention centers,” with pics coming from the Chicago area. One guys comment about extending the Gold Line to Whittier. He need’s it so he can attend Laker, Clippers, and Kings games at Staple Center. Screw those stuck in grid lock on the westside I guess. And a study and planned Subway along 405 corridor. They just spent billions widening the freeway. When do the rest of us get relief? Buses are late or no shows due to traffic, accidents and break downs. Occasionally due to no operators or no equipment. Seems impossible for the last two and management in charge are held accountable. And why do they need to build another tunnel under the Hudson River, a bridge would be cheaper. The trains need to arrive underground on the far west side of the city, so a tunnel wouldn’t work. OTOH, the old saying still holds true. There is no such thing as “free money” in this world. Call it a grant, sure it doesn’t have to be paid back, but it still comes from taxpayer money and most of the federal grant money likely ends up disappearing to paying off public employee union benefits and pensions that state and local governments cannot fulfill. 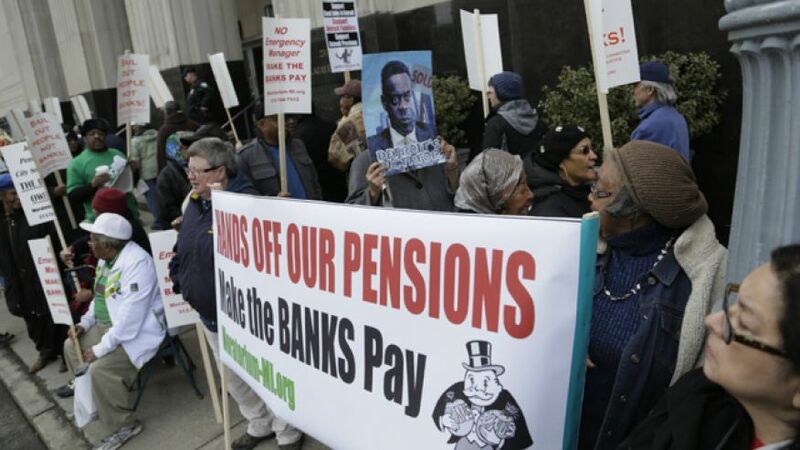 I’m very sure the pesky hands at CalPERs will want a piece of the cookie jar to help fund their billions of dollars of unfunded pensions from years of corruption and financial mismanagement. You sort of allege that federal grant money intended for transit is being siphoned to other uses. You offer no proof of that in your links and I’m unaware of any allegations to that effect. I stand by my contention: grants are enormously helpful to public agencies trying to build big, expensive projects. Metro is receiving a $1.25-billion grant to build the first section of the Purple Line Extension. Metro is also receiving a $670-million federal grant for the Regional Connector project and the agency is applying for a significant grant to build the second section of the Purple Line Extension to Century City. Again, why does Metro keep leaving out the motorcycle/scooter option?! It’s just as efficient and cheap as all the options out there, you know. And no, you can’t use the excuse that they consume fossil fuels so it hurts the environment so we don’t recommend that. A scooter is just as environmentally friendly as a hybrid vehicle, if not more. A hybrid car get 50 MPG, a scooter gets 100 MPG! Changing to a scooterist lifestyle is actually twice as more gas savings than the best hybrid vehicle out there, a tremendous savings to people who live the car lifestyle. I really wish Metro start including the motorcycle and scooter option more. Work together with the California Motorcyclist Safety Program, Motorcycle Safety Foundation and the CHP for this! You do want to promote safe driving by motorcyclists too right? I encourage those who pursue the scooter option to get one with a four-stroke engine — generally speaking much better emission-wise than the older two-stroke kind. I also encourage everyone to take a safety class given the speeds that some scooters can reach and the fact that you will always be out there in lanes with bigger, heavier cars and trucks. You have an anime wallscroll and if it’s legit licensed product (North American market), it’s made by Great Eastern. Thanks for reading and adding that factoid! I wonder if those in the valley who clamor for transport options are aware of the rail line that already serves Glendale, Burbank, Van Nuys, Northridge and Chatsworth. 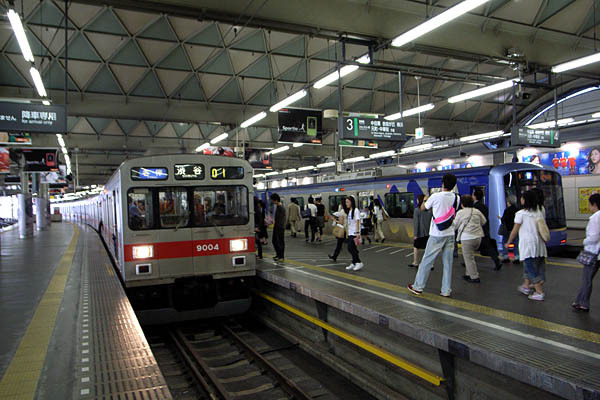 It uses regular trains, but there would be a much lower cost to upgrade it to double-track, electrification and more frequent service than extending the Red Line or converting the Orange Line to light rail. If by those services meaning Metrolink, then it’s more of a political issue. Metrolink is a separate bureaucracy that deals with six different counties and upgrades to Metrolink will mean you need to get the other five counties involved. LA County can’t go it alone just because they want to. Just because Metrolink serves Glendale, Burbank, Van Nuys, Northridge and Chatsworth, doesn’t mean LA County can go ahead with double-track, electrification and more frequent services on them. 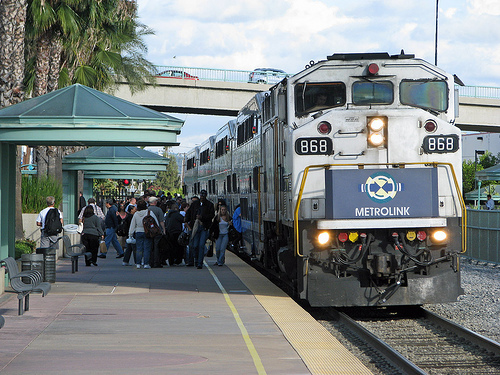 The Metrolink line that serves those stations also happens to extend out to Ventura County. Whose going to pay for the cost of electrification, double tracks, and frequent services between the Ventura County portions of that line, from East Ventura to Simi Valley? You think Ventura County is going to vote for something to use their county taxes for that? Or is LA County going to pony up the tab for Ventura County infrastructure spending? Currently, about half of the Metrolink trains on the Ventura County Line don’t go to Ventura County anyway, terminating instead at Chatsworth or Burbank. I’m sure Ventura County (and Amtrak) won’t object to L.A. County improving its portion of the line and funding additional local trains on it; the infrastructure upgrades can only help with the reliability of service to Ventura County and beyond. Running diesel and electric trains on the same rails can also be done. A bigger obstacle is freight, which also uses the same rails and is generally incompatible with high-frequency passenger service. Also, Metrolink and Amtrak also share many of the tracks and stations themselves which will require a complete redesign of these stations as well as the trains to be used. If you change Metrolink, Amtrak also has to change as well. Yes, you can run diesel trains on electrified tracks, but not the GE locomotives that are being used today. Platforms don’t need to be raised for electrification, an electric train can serve a low platform just fine. With the right rail car design you can even run a single train through both low and high platform stations; this is the case, for example, on New Jersey’s Morristown Line, and has been for decades. The line is also part electrified. Incidentally, some of NJ Transit’s high-low platform cars, the former Comet 1B’s, are now in service in California on Amtrak’s San Joaquin route. I rode in one of these trains last fall and noticed that Amtrak chose to preserve the high-low platform mechanism, even though all the stations on the San Joaquin route are low platform (the cars were thoroughly refurbished after being transferred from NJ Transit). Contrary to what is the norm across the United States the Union Pacific does not own the tracks, METRO LINK does. So instead of METRO LINK having to negotiate improvements in service with Union Pacific, Union Pacific will have to negotiate when it can run it’s trains. I do however see it going to court if Union Pacific is placed in to much of a bind. Also there most likely is a stipulation concerning U.P.’s use in the agreement between Southern Pacific and METRO LINK when the track-age was sold.